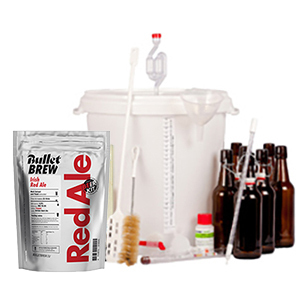 Clean and sterilize your fermentation bucket, lid and mixing spoon/paddle with a suitable cleaner/sterilizer product. Set aside the sachets from the dry compartment of the pouch (where these instructions were located) for later use. Pour the liquid malt extract from the wet compartment of the pouch into your fermentation bucket, rolling and squeezing the pouch to get out as much extract as possible. Then using a small amount of warm water, rinse out any remains and also add to the bucket. Boil 3L of water and add to bucket, then add the dextrose brewing sugar additions for your beer kit style, as shown in the table below, and stir to dissolve. If your beer kit contains a sweetener sachet, add this now. Top up the bucket to the volume shown in the table below using cold water, then stir well to thoroughly mix. Using a sterilised thermometer, check the temperature is below 25 0C before sprinkling contents of the yeast sachet onto the surface of the liquid (no need to stir). Half fill your airlock with boiled and cooled water and fix to your lid, then tightly fasten the lid onto the bucket. Leave your fermentation to stand at a stable ambient room temperature between 20 0C and 25 0 Below 200C fermentation will take much longer, and below 16 0C may stop altogether. Above 25 0C beer quality will be affected. If your beer kit contains a sachet of hops, proceed to instruction 9. If not, jump ahead to instruction 11. Use a hydrometer to check the specific gravity (S.G.) of your beer after 5 days. If <1.018, sprinkle the content of the hop sachet (if included) on to the surface of the beer (DO NOT STIR). If >1.018, check again in 1-2 days until the S.G. is <1.015 before adding hops. Leave your hopped beer to ferment for a further 2-3 days before continuing with instruction 11. After 8 days of fermentation (or 2-3 days after hop addition) use a hydrometer to check the specific Gravity (S.G.) of your beer. If at or below the values in the table below, fermentation may be complete. Before proceeding to bottling, check the specific gravity again over the next two days to ensure it has stabilised. If in doubt, always leave your beer a little longer to ensure fermentation is complete before bottling your beer. WARNING: specific gravity must be stable for 2 days before bottling. Never bottle until fermentation is complete. Clean and sterilise your bottles and siphon tube using a suitable cleaner/sterilizer product. Use only reusable flip top or crown cap beer bottle, or PET bottles. Do not use any damaged glass bottles, reject even if only slightly chipped or with minor imperfections. Siphon your beer into the bottles, filling to approx. 5 cm below the rim of the bottle neck (note that if hops are added, flow may slow down towards the end due to solid matter clogging the siphon). Add one rounded teaspoonful of priming sugar per 500ml bottle for lager & Belgian beer, or a level teaspoonful for all other types. Seal the bottles and shake well before storing in a warm place for 2 week, then transfer to a cool, dark place for clearing. Your beer is ready as soon as clear, but for will improve with age (lagers and hoppy beers are best drunk within 6 months, but other ales and dark beers will keep longer). Serve your beer chilled, pouring slowly & carefully in one go to avoid the yeast sediment from the bottom of the bottle being transferred to your glass.